People in the West are rightly questioning the contributions of the Islamic World for the development and implementation of human rights or humanity, which are late achievements of the Enlightenment of the West of the 18th century; or peace in the last couple of centuries. Especially the latter contributions by the ‘West’ might of course be questioned as well. However, one should in any case constantly remember Islam’s genuine achievements when Europe underwent especially dark ages, namely the end of what people there called the Middle Ages. These medieval times were brightly illuminated in the Islamic World which extended from India, Central Asia, the Middle East, North Africa and, of course, Al Andalus, i.e., the Iberian Peninsula. If interested in exploring medieval Islam, stunning emotions can certainly be expected when visiting Esfahan in Central Iran, one of the most beautiful cities of the world. More than once I had a vision of George W. Bush and his wife Laura sitting together with, say, Mahmoud Ahmadinejad and his wife on the roof of the small tea house in the northwestern corner of Naqsh-e Jehan, the central square in Esfahan and one of the largest in the world, smoking qaliyan, or hubble-bubble, drinking sweetened tea (chay), talking about God and the World. The sophisticated Safavid architecture with the Shah mosque in the southern corner of the square, the Lotfallah mosque at the eastern side and, opposite, Aliqapoo palace, with the mountains in the background and sun setting is actually overwhelming, a vista that can hardly be topped anywhere in the world. Maybe the course of the world would change afterwards. Maybe not. People, who I told my vision, indulged me smiling but considering me completely naïve. Of course, Bush would like to bomb the mosques. In October 2007, on my last visit of the city, I had a special destination. I had read with increasing interest a recent article published in  about a simplifying technique employing so-called girih tiles for the outer beautification of late medieval Islamic buildings. A further breakthrough in tiling during the Timurid era in the 15th century may be considered a cultural if not scientific sensation. Its mathematic background was thought to be properly described only 500 years later by 20th century’s astronomer and recreational mathematician Sir Roger Penrose. According to the article, a couple of examples of quasi-crystalline tiling may in fact be found in the old city of Esfahan. In Islamic architecture animated creatures are usually not displayed for mere decoration. Instead, mosques and other buildings are over and over covered with ceramic tiles with both calligraphy from the Holy Qur’an and dazzling geometric patterns. The two authors of the Science article, Peter J. Lu from Harvard and Paul J. Steinhardt from Princeton, illustrate that most of these already incredible patterns may be drawn as zigzagging lines where the lines were directly drafted with the aid of a straightedge and a compass. An important aspect in Islamic tiling may be periodic repetition of a ‘unit cell’. Rotational symmetry may be desired in some cases in order to enhance the overall impression of complexity. Lu and Steinhardt mention that it had been shown in the mid-nineteenth century by western mathematicians that only two-, three-, four-, and six-fold rotational symmetries are allowed. Five- and ten-fold symmetries are crystallographically forbidden. While pentagonal and decagonal motifs appear frequently in a unit cell, they are usually repeated within the allowed symmetries. Although possible in many cases, especially larger artwork demands simpler techniques than drawing lines with straightedge and compass. Lu and Steinhardt showed that by 1200 CE Islamic artisans rather used a set of five different types of equilateral polygonal tiles for creating an almost unlimited number of complex tessellations: a decagon, a pentagon, a hexagon, a bowtie, and a rhombus, which they called girih tiles. Each tile had decorating lines which intersect with the midpoints of every edge at angles of 72 and 108 degrees. Lu and Steinhardt provide strong evidence that girih tessellating was the only way to create the almost incredible patterns on the (periodic but on a much larger scale) wall panels of the famous octagonal tomb tower Gonbad-e Kabud (Blue Tower)in Maragha (1197 CE), in the Azerbaijan province of Iran (see figure 1 below). While the decagonal pattern in each panel does not repeat, the ‘unit cell’ of this explicitly periodic tiling spans the length of two complete panels, in fact several meters. Furthermore, while the main decorative brick pattern follows the above mentioned decorating lines, another set of smaller lines conforms to the internal rotational symmetry of each individual girih tile without adhering to pentagonal angles. Within each region occupied by a hexagon, bowtie, or rhombus, the smaller line decoration has a two-fold rotational symmetry. I must admit that ‘seeing’ the girih tile pattern in Lu and Steinhardt’s pictures took me some time. There was a further and in fact hardly to believe breakthrough in tessellations when artisans of the Timurid period in the late 15th century applied self-similarity transformations in girih tiles. Larger girih tiles were subdivided into smaller ones. Thus, overlapping patterns at two different length scales were created in which each pattern is generated by the same girih tile shapes. A stunning and revealing example of self-similarity (where, in addition, outlines of girih tiles are clearly given in lighter ink) can be seen on a Timurid-Turkmen scroll belonging to the collection of the Topkapi Museum in Istanbul which has first been described by Professor Gülru Necipoglu, Aga Khan Program of Islamic Architecture at Harvard. Another example was published in Lu and Steinhardt’s paper. It may be foundin one spandrel of the Darb-e Imam shrine (figure 2) complex (1453 CE) in the old city of Esfahan . The authors clearly indicate that, for instance, the basis of the right spandrel (as indicated by a large, thick, black line pattern) of a kind of portal is formed, on a much larger scale, by four decagons and two bowties. It can, however, be subdivided into smaller patterns, which can be perfectly generated by a tessellation of 231 girih tiles. The authors have even identified the subdivision rule to generate this pattern on one this particular spandrel at the Darb-e Imam shrine. And there are other examples of self-similarity there which may be studied there. A subdivision rule in combination with decagonal symmetry has apparently allowed these medieval artisans to construct (consciously or not) perfect patterns with an infinite quasi-periodic translational order and crystallographically forbidden pentagonal or decagonal rotational symmetries. The sensation here is that western scientists have understood this principle only about 500 years later. So-called quasi-crystals are structural forms that are ordered but in essence nonperiodic, meaning a shifted copy will not ever match with the original. Although not being the first describing nonperiodic sets of tiles, since the mid 1970s, astronomer Roger Penrose described a set of six tiles, famous ‘kite-and-dart’ tiles, and another set consisting of two rhombuses with equal sides but different shapes which allow aperiodic tiling and five-fold symmetry. Lu and Steinhardt now indicate, in their 2007 paper, that the tile pattern of the particular spandrel in the Darb-e Imam can be mapped directly into the kite-and-dart Penrose tiles using a self-similar subdivision of large girih tiles into smaller ones. Thus, all prerequisites for the creation of infinite quasiperiodic patterns were available to the medieval artisans in Esfahan: girih tiles, decagonal rotational symmetry and self-similar subdivision. In their supporting online material, Lu and Steinhardt identify local point defects in the right spandrel, where the Penrose matching rules were violated. According to their interpretation, these mismatches and other facts point to the fact that the artisans did not really understand what they had actually achieved. 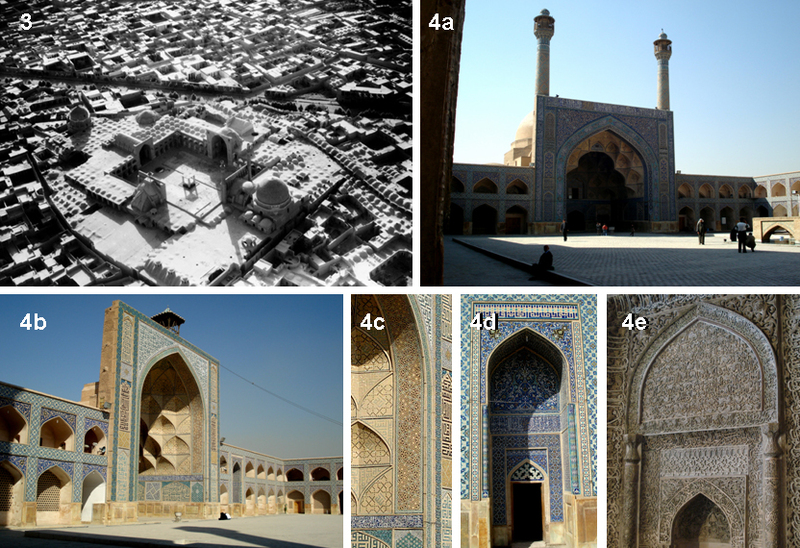 Not more than 300 meters to the east of Darb-e Imam lies the much more famous, magnificent Masjed Jomeh, Esfahan’s Friday mosque (see an aerial view in figure 3 and the main, southern iwan in figure 4a). Different parts of this wonderful mosque, which is considered by Arthur Pope as one of the world’s most awesome Islamic buildings, cover several centuries of medieval architecture. Amazingly, decagonal tessellations have been described by Lu and Steinhardt only at the portal of the western iwan. Lu and Steinhardt present a picture of the pattern in the supporting online material only which very much resembles that on the Darb-e Imam (see figure 4b and compare with figure 2c). Why has that decagonal tile pattern not been applied in other areas of the just wonderful mosque with its several styles from the Seljuq, Timurid and even Safavid periods? The origins of the first mosque date back to the early 8th century. Legend tells that the first mosque had been erected at the site of a Sassanid fire temple. Under the Abbasid Caliphs the first building was considerably enlarged in the 9th century. The main structure which is still visible today was erected by the Seljuqs who had chosen Esfahan as their capital in 1051. As Henri Stierlin writes in his monumental work on Islamic art and architecture , during the vizierate of Nizam al Molk (d. 1092) architecture especially in Esfahan developed a distinctive form and the full range of its modes of expression thanks to the technological innovations of the Seljuq period. It is important to note that ceramic tile decorations at Esfahan’s Masjed-e Jomeh were added considerably later. The main axis of the mosque with the two enormous domes is oriented in the Makkah direction. The large southwestern main dome has a diameter of 14 meters. The smaller one in the northeastern corner was built by Nizam al Molk’s political rival Taj al Molk in 1088 possibly based on blueprints of mathematician Omar Khayyam (d. 1122) who then lived in Esfahan . The dome with a diameter of about ten meters, called Gunbad-e Khaki (Dome of the Earth) is widely considered to be the finest brick dome ever built. It is mathematically perfect and has survived dozens of earthquakes the country is plagued so much, for more than 900 years. The four iwans of the Masjed-e Jomeh illustrate impressively the varieties of decorative arts of Esfahanian architects of the Seljuq period in late 11th century. While the northern iwan has a simple pointed tunnel vault only, three iwans present with apses with elaborate muqarnas, or honeycomb-like structures, and are beautifully decorated with kufic calligraphy and geometric patterns (figures 4a, b). There are several large hollow spherical triangles derived from the “squinch, a constructional device that was rigorously and rationally formulated under the Seljuqs” as Henri Stierlin writes (p. 30). With regard to the present article the western iwan deserves special attention. It is the most unusual and complex of all. First, as is also shown in Henri Stierlin’s marvelous book (p. 31), it presents, at its back view, an extraordinary ribbed structure. “The technique used in the 11th century to support large honeycomb vaults grew out of an intensive study of the resistance of brick arches carried out in Seljuq Iran.” It presents with “… a large-scale muqarnas vault in which the juxtaposed spherical triangles are not only decorative but functional in a very original way, making up a system as ingenious as that of Buckminster Fuller’s 20th-century geodesic domes” (ibid, p. 215). And, as mentioned before, similar tile patterns as the quasi-crystalline ones on the Darb-e Imam can be found on the inner sides of the portal . The same subdivision rule applies here as on the tiling on the Darb-e Imam shrine nearby. Esfahan’s Masjed-e Jomeh shows many more interesting details on its four iwans. The tessellations on the western portal may be one interesting scientific issue. While wandering through this 1300 year-old unique testimony of Islamic history one gets, however, more and more excited about its perfection in both its overall architecture and even the smallest details (see, in particular, Henri Stierlin, pp. 214). The Great Seljuq Empire stretched from Central Asia to Syria. Seljuqs were Sunni Muslims. The founder of the dynasty, Seljuq himself, had converted his Central Asian Turkish tribes to Islam in the mid 10th century. Under Toghrϊl Beg (d. 1063) the Abbasid Capital Baghdad was taken from the Shi’a Buyid dynasty in 1055. Under the reign of, in particular, Alp Arslan (d. 1072) and Malik Shah I (d. 1092) remarkable monuments were created. Their perspicacious and inspirational vizier Nizam al Mulk had a great influence on the development of Esfahan as the center of Persian power. Art and science were flourishing and major architectural projects were encouraged by the Seljuq rulers. On tomb towers (gunbad) and mosques, complicated geometric brick and stucco patterns were used for ornamental beautifications. One famous example is the already mentioned octagonal Blue Tower (Gunbad-e Kabud) in Maragah with its periodic albeit immensely dazzling network of glazed bricks on its eight panels. Maragah was famous for at least five gunbads, and four can still be seen there. Key feature of the mosques were four conch-shaped iwans facing each other and marking the two axes of the building which met in the ablutions fountain. This typical Persian outline of a mosque, its four iwans with recessed space covered with either a pointed or hemispherical vault, may in fact be a further development of the Sassanid royal hall (see Henri Stierlin, p. 298). While under the Seljuq rulers Persia experienced an early renaissance which cannot be overstated, it must also be emphasized that, as always in its so long history, what is called Persianization of the Turkish intruders from Central Asia took place. The same was true when Tamerlane (Timur Lenk, d. 1405) had conquered Iran and wreaked havoc and incredible massacres among civilians including building pyramids of sculls of killed inhabitants of the conquered cities, in particular in Esfahan in 1387. Under the Timurid rulers, science and art flourished again in Iran. Samarqand and Bukhara in Transoxiana as well as Esfahan and, for example, Mashhad experienced an incredible proliferation of geometric decorations on mosques, madrassahs, and mausoleums. In addition to rigorous geometry (including the above quasi-crystalline patterns) and kufic and, in particular, thuluth calligraphy, now plenty of interwoven vine twines and flowers occur. The true peak of splendid virtuosity of Timurid decoration in Iran may again be found at Esfahan’s Friday Mosque, especially on the southern iwan with its elegant vases of flowers and on the doorway north to the western iwan, facing the courtyard. The latter was built by Sayyed Mahmud in 1447 . An especially fine example of great Timurid architecture in present day Iran can be found in Mashhad in Khorasan. The Holy Shrine of the Eighth Shi’a Imam, Reza, and the fine Azim-e Gohar Shad Mosque (1416) were commissioned by the wife of Tamerlan’s eldest son Shah Rokh. Under the influences of Gohar Shad and, in particular, her son Ulugh Beg (d. 1449), Persian language, art and science became central elements of the Timurid dynasty. The exceptionally fine ceramic cladding as well as sturdy drum and bulbous dome are clearly related to more Timurid masterpieces in Transoxiana, in particular, in Samarqand and Bukhara. On photographs taken in the late 19th century, the splendor of façade decoration but also interior designs in these almost mystical cities on the legendary Silk Road are obvious . Coming back to decagonal and quasi-crystalline tilings as a further scientific breakthrough of medieval artisans one has to ask why they have been so rarely implemented among the huge variety of just periodic tiling, vine and flowers, and calligraphy. It is quite obvious that these late medieval artisans and architects commanded the whole repertoire of techniques, periodic or nonperiodic, with great proficiency. Based on the evidence presented by Lu and Steinhardt, it may be a mere speculation whether or not they really understood what they did. If occurrence of quasi-crystalline tiling can in fact be traced to the Timurid period at the end of the 15th century, first, more examples have to be detected and studied. The top contemporary mathematicians may in fact be found at Samarqand’s University which was founded in 1420, for example Ulugh Beg and Ghiyath al Kashi (d. 1429) and their group. The scientific dispute  after Lu and Steinhardt’s paper about when aperiodic patterns have been introduced in Islamic tiling may be considered even immature. It may provide some insights in profound misconceptions and even dogmatism which might point again to the incredible superior sovereignty of artisans living several hundred years ago, who probably did not care to much about ‘scientific breakthroughs’ when decorating mosques in the praise of the Almighty. Time for further research is running. I have found only one short note by Iranian news media after the publication of Lu and Steinhardt’s paper which otherwise aroused considerable interest worldwide. Whether there are current investigations by Iranian scientists at the Darb-e Imam shrine is not known. Renovations in November 2007 may actually have prevented me from detecting one of the spandrels displayed in Lu and Steinhardt’s paper. The pattern on one looked similar (see figure 2d), but kufic descriptions at the margins essentially differ from the published picture. And finally, the political situation in present day Iran doesn’t make things easier. In fact, Peter J. Lu identified decagonally symmetric motifs on two different length scales, a telltale sign of what is called a quasi-crystal, on a photograph of the Darb-e Imam shrine only, as John Bohannon writes in a short editorial of Science (2007; 315:1066). He visited the site in Esfahan earlier this year (personal communication). Stierlin H. Islamic Art and Architecture. Thames & Hudson Inc., New York 2002, pp. 29ff. Architecture in Medieval Iran is generally considered ‘Islamic’. One has to keep in mind, however, that Iran was inhabited by rather great subpopulations of Christians, Jews, and Zoroastrians as well. Nowadays, that does not hold anymore, of course. The most gorgeous monuments are in fact religious, Islamic, buildings. Howver, Omar Khayyam, for instance, who was involved in the planning of the northeastern dome of Esfahan’s Friday Mosque, was not an avowed Muslim but rather a free spirit. A universal genius, who had not only contributions in poetry (for what he is well-known in the West after Edward Fitzgerald’s (d. 1883) translation of the Rubaiyat), but also and even more in astronomy and mathematics, who has laid the foundation of non-Euclidean geometry several hundred years before its final conception in the 19th century. Iran’s solar calendar, introduced in 1925 in an attempt by Reza Shah (d. 1944) to secularize the country, is based on his calculations, too. It is more precise than the Gregorian calendar which is used in the West. Omar Khayyam’s very special, almost modernistic tomb (in fact not ‘Islamic’ at all) is located in Nishapur in Khorasan, Eastern Iran. The decagonal but distinctly periodic structures are only shown in Lu and Steinhardt’s supporting online material. They date the mosque (or the tessellations on the western iwan’s portal only?) to the late 15th century. As has been mentioned already, the mosque is much older. Its origin can in fact be assumed in the 2nd century AH. The respective sanctuary contains an extraordinary example of a stucco mirhab built in 1310 by the Mongolian Il-Khan Öljeitü. Naumkin V. Caught in Time: Great Photographic Archives. Samarkand. Garnet Publishing Ltd. Reading 1992. In the same series and by the same author, a book with early photographs of Bukhara appeared in 1993. Most of the photos had not been published before 1992. Among the Samarqand photos, few seem in fact to indicate quasi-crystalline tiling patterns(?). See, for example, Fig. 3, the spandrel of the portal at the Shah-i Zindah complex (p. 6); at the famous Registan (Figs. 82, 83 on pp. 120f); or at Ishrat Khana (Figs. 87, 88 on pp. 128f). See, in particular, Makovicky E. Science 2007; 318: 1383. This posting is dedicated to Ms. Dora Fischer-Barnicol whose profound knowledge about and sympathy for foreign cultures may be one of the main reasons for my constant interest in the Middle East and its people. This entry was posted in Art, Iran, Islam, Science and tagged Bukhara, Darb-e Imam, decagonal symmetry, Esfahan, girih, iwan, Masjed-e Jomeh, Omar Khayyam, Paul J. Steinhardt, Penrose tiling, Peter J. Lu, quasi-crystalline, Samarqand, Seljuq, Timurid, Ulugh Beg. Bookmark the permalink. I was just looking for something else altogether and stumbled over your fascinating blog. I’m mainly working on the Safavid period in Iran – having re-traced Shah Abbas 1000km walk in Isfahan from Isfahan to Mashhad (more details on my website) – but I also have a big interest in the Penrose tiling issue – thanks for publicising it here. Surely, however, its not just Darb-i Imam and the Gonbad-i Kabud, but also the great, gorgeous designs at Zuzan that show Penrose designs? If you havent seen these, let me know and I’ll send you pics. Lu et al mention them, even if I hadnt remembered them. And Zuzan is the most wonderful monument, deserving more publicity, even if it isnt the easiest place in the world to get to! 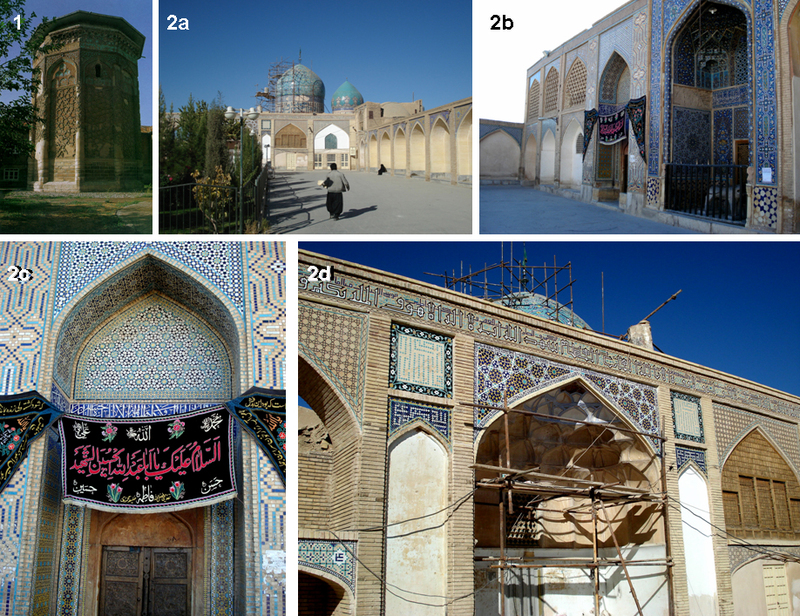 It s a good article – but theres been lots of excavations and new finds since 1985 – including a stunning mihrab! I’d suggest that you make time to go when you’re next in Iran! I’ve just read it. I have also checked the pictures by Renata Holod. Do you mean the strapwork pattern on the eastern side of the southern iwan? It seems to employ four-fold symmetry. I had visited Esfahan last time in 2008/09. I am afraid that it will take some time to go back.